The Conservators of the River Thames, 1857 -1974. 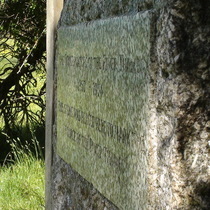 This stone was placed here to mark the source of the River Thames. The lettering in this granite stone was originally picked out, probably in gold or black, but now the only way to see that the lettering even exists is to catch it unawares at an angle. The finger-post directs: "Thames Path, Public Footpath" and, in the same direction, "Thames Barrier London, 184 miles, 294 km". Go to the source of a river and, call us simple, but we'd expect to see a river. Nothing; not a droplet; not even a dampness in the ground; no-oo river. Follow the path and it's some time before you even see a dip in the land, and that gradually becomes more vegetated than the surrounding fields, and then it turns into something that looks like a dry river bed - we've walked on the bed of the River Thames. This gradually became damp but it was over a mile before it could be described as running water. This was in June and we were told that at other, wetter, times of the year the ground in front of the stone is very boggy. All to do with the level of the water table. There is another site competing for the title "source of the Thames", at Seven Springs in Gloucestershire but, until we have visited that, we are backing Kemble.